Cassata ice cream is everyone's favorite ice cream for sure. It tastes, of course, creamy and outstanding but the time taken for setting this ice cream is unbearable. Waiting for a whole day to taste a dessert, its something weird I know. But it's really worth. This multilayered icecream was my favorite dessert in my school days. Still, it reminds me of those sweet memories I spent with my friends and cousins. But today the popularity of this ice cream has been overtaken by other desserts like puddings, cakes, falooda etc. 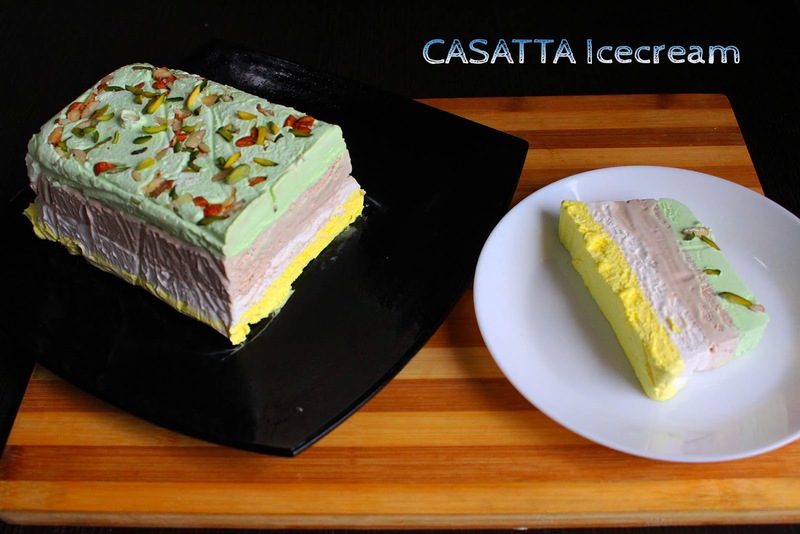 Actually, cassata is a frozen dessert with multi-colored or flavors of ice cream topped with nuts. But these days you can see different versions and many recipes of cassata. Actually, I prefer buying ice cream from nearby grocery or ice cream parlor. Recreating the same taste in our home is really boring for me. I love to make desserts with my own personal touch. I hate recreating the same taste, especially in desserts and snacks recipes. Let's move on to the recipe showing how to make casatta ice cream at home. Whip the whipping cream until stiff and then add the condensed milk. Combine very well. Once it is done, transfer the whipped cream into 4 bowls equally. Add chocolate syrup, pista essence, vanilla essence and badam essence in each bowl separately and mix well. Cover it with an aluminum foil and keep it in the refrigerator for an hour. 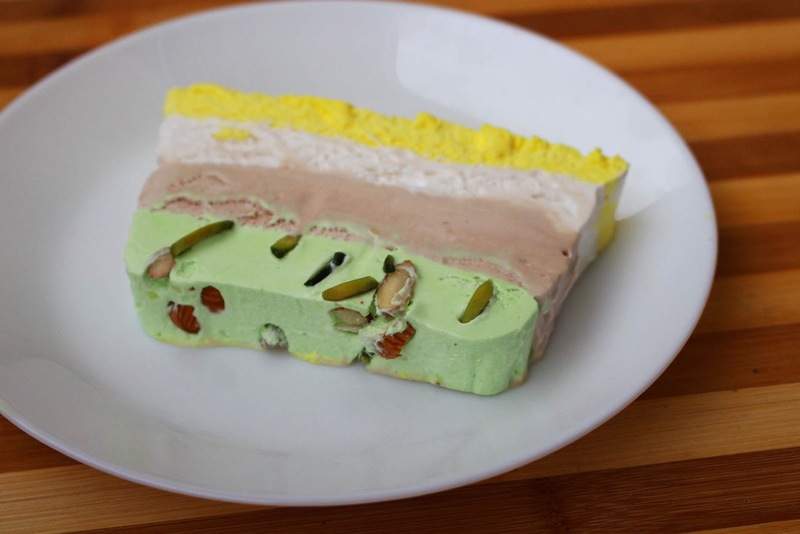 Spread some nuts and then spread pista ice cream as the base layer. Cover and keep it in the freezer for 2 hours. After 2 hours, spread the second ice cream and freeze it again for 2 hours, covered. Repeat the same after 2 hours. Spread the third ice cream layer and freeze for 2 hours and finally spread the last ice cream and freeze for 8 to 10 hours, covered. After 8 hours flip the ice cream to a plate and then slice it. Serve immediately.